Xiaomi has launched lots of good phone like Redmi 1s, Redmi 2, Mi3, Note 4G and Mi4i these are now trending phones in the market. Here i will tell you some hidden features and tips and tricks of all Xiaomi phones. 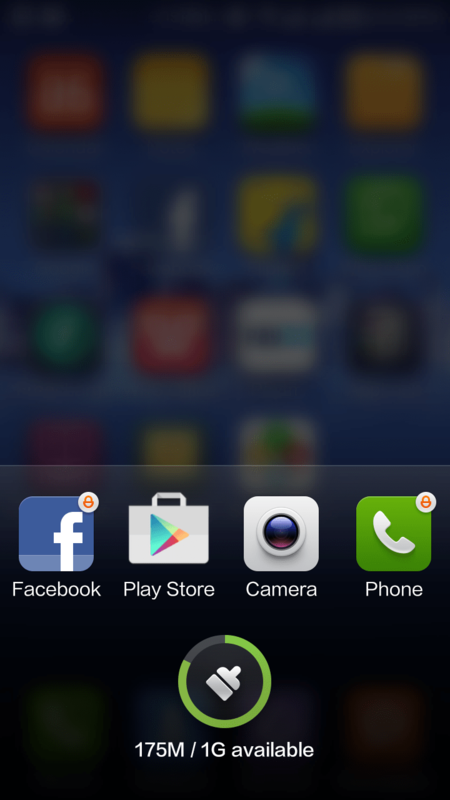 Basically these are hidden tricks of MIUI 5. You can check these ultimate features and tricks. Its same for all Xiaomi phones with Miui 5. Xiaomi Redmi 1s, the best Android phone in the range of 6k in India. Beside good hardware configuration, it has many awesome features. Many of its features come out when you use it. There are lots of many other features that are hidden. I found out these features after 1 month, i bought it. Lets see these Redmi 1S hidden features or Redmi 1s Tips and Tricks. Also check the new Redmi Note 3 tips and tricks. 1. Lock Apps To Load Fast : Generally when we initially run any app, it takes some time to load. But when it load once in your phone RAM, it run faster, next time when you open this app, it will open faster then earlier. The reason behind this is, your app data get store into your RAM, so when you switch to this app again, it load faster. But in case if you have close the app, like we generally do by holding our home key and cleaning all open apps from our memory. Now in Redmi 1S there is an option , you can lock certain app in memory. So next time when you clear your memory by holding home screen. these apps will not get clear from memory. How to Lock apps in Memory ? Just hold your home key for a second, it will show all the open apps. Now simply slide down the app icon (that you want to lock) and leave. Now you will sea a lock symbol on that app icon. Now try to clear your memory, the app you have locked will not get clear from your memory. To unlock it, use the same procedure by sliding down the app icon. You can use this feature to lock those app that you use frequently. Like whatsapp, Facebook, Contacts etc. So when you open these apps, they will load fast. 2. 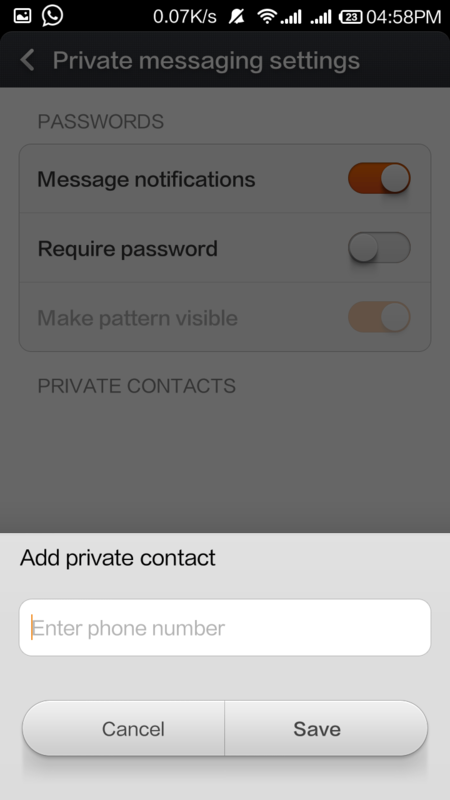 Private Messaging : In your Redmi 1s , there is an option of private messaging i.e hidden from general user. when you open your Message app. You can see and read all message. But there is an option of private message also. Just drag down your message screen. A private message screen will get open. 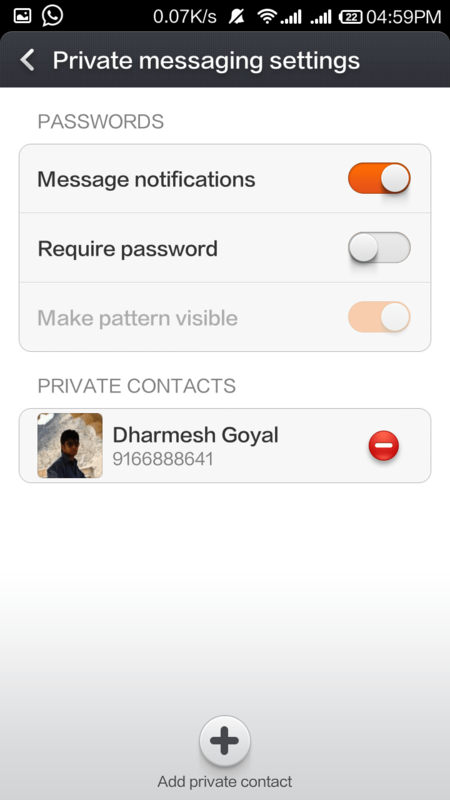 Now tap to Private Messaging Settings, Now you can add your Private Messaging contacts here. 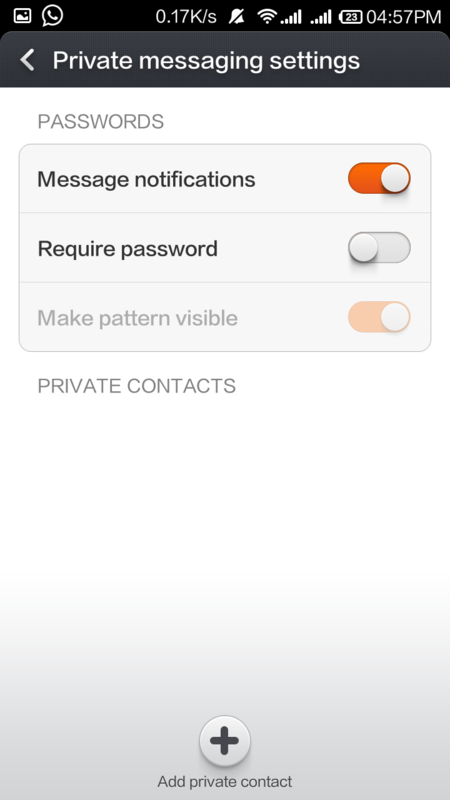 You can also set lock to your Private Messages. 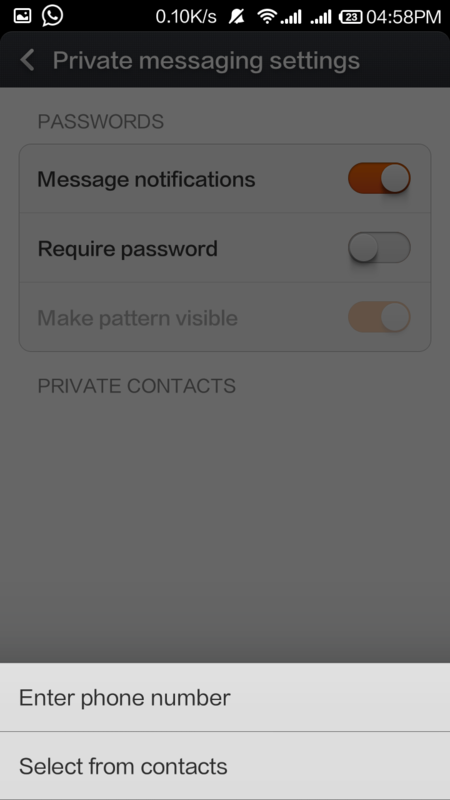 Next time when you receive message from these contacts, they will directly moved to your private messages screen and will not appear into your general messaging screen. To view your private message simply drag down your message screen. Your private message screen will appear. 3. Guest Mode: Some time when some one ask me for my phone, i hesitate to give as there are lots of personal data like my contacts, messages, photos. That i don’t want to share with anybody. But we can not say no to that person. In that case this guest mode will help you. There is an inbuilt Guest mode option in Redmi 1s, i think many of you know this. You can enable it from your toggles bar. You can even set password on it. When you enables guest mode all you apps data like contacts, Call Log, messages, Gallery will get hidden. When any user open these apps, they will find it blank. So it is one of the way to protect your personal data while handling your phone to some one. 4. DND: Do not Disturb You can enable this mode from the toggles bar. This mode will silent your calls and messages. You can also set time for DND or also schedule it on daily basis. Like if you don’t want that any body disturb you while you sleep. Just click Recurring DND time and set the time. Now everyday this mode will enable at this time and will get off at your scheduled time. You can also set exceptions for some calls . Like you want if you that your phone will rang only when your GF calls you. Just add your GF contact in exception list. Now your phone will only rang when your GF will call you otherwise it will remain silent. There is an option for Repeated Calls, if you receive repeated call from the same number within 3 minutes. Your phone will ring in that case. This DND is very helpful for me, it has all the options that i want. 5. 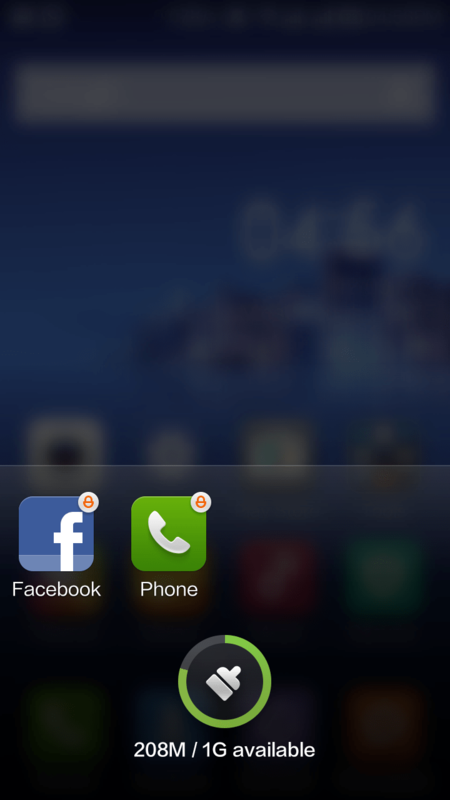 Screenshots: Now you can directly take your phone screen shots by using Screenshots option in toggle bar. Or you can take Screenshot by pressing Power+ volume Down Key simultaneously. 6. Disable Navigation button : Enable this option from Toggle menu and all your Navigations keys get disabled. 7. Inbuilt App Locker : Now you don’t need to download third party app to lock your apps. 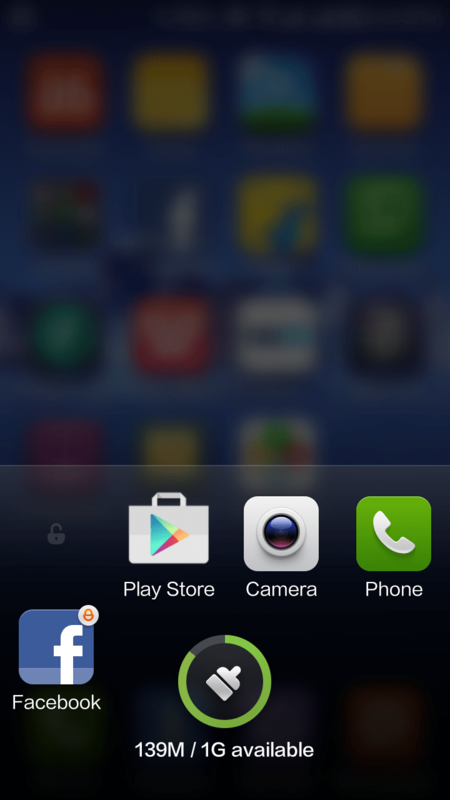 In Redmi 1 S you can lock your apps directly from Access option. Just go to Access option in Toggle menu. Now turn on Permissions. Now it will ask you to set your pattern. After this touch the Lock Apps option. Now draw your pattern. Now it will list all your apps. You can simply enable lock for the app you want to secure. 8. Data Restriction for Individual app: Yes now you can restrict your data usage for individual app in Redmi 1s. Even you can also decide , which app to use mobile data or WiFi. There are lots of apps like games and for those app you don’t want to waste your data. As most of these apps use your data for ad fetching. So most of your data that goes waste in ads. Now you can restrict those app to use your data. To use this feature, just Go to Security >> Data Usage. Now tap Restrict option. It will list all your apps with tick mark option for mobile data and Wifi. Now you can chose to which app you want to give Mobile data or WIFi. Simply by ticking these options for individual apps. Data Saver : There is also one feature that will automatically save your data by reducing data wastage. You can simply enabled it from Saver option in Data Usage. 9. 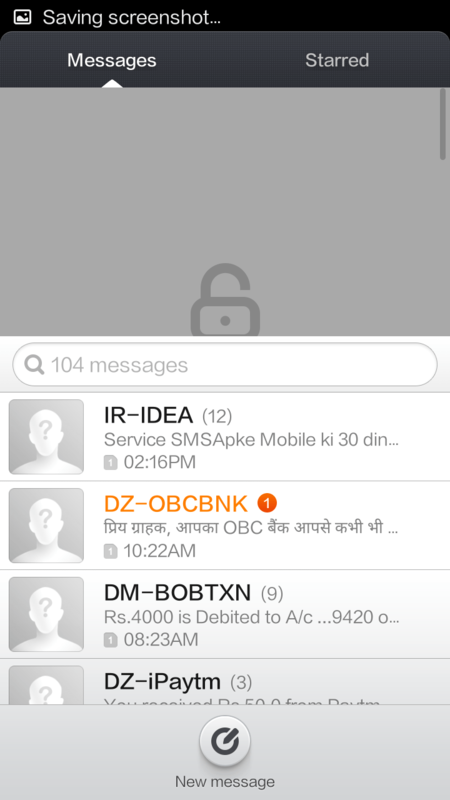 Blocklist : There is an inbuilt Call and Message Blocker in Redmi 1s. Now you can block the unwanted calls directly. You can add these numbers in Block list. Simply Go to Security >> Blocklist and then tap the setting icon and add the numbers you want to block. In Redmi 1s , it automatically detects the spam messages and move them to Blocked message inbox directly. 10. Power : In Security menu there is an power option that let you switch to different mode automatically to save power when Battery is low. Like if battery is only 20% it will switch to Marathon mode and disable your mobile and wifi date. You can also schedule it like in night 11pm-7 am , you can set it to automatically switch to sleep mode. You can also set, How your battery icon will look, Graphical, Percentage and Top Bar. You can select from these three options. 11. Virus Scan: In Redmi 1s there is an inbuilt Anti Virus system. You can also scan your device for virus. Somply go to Security and then to Virus Scan option. Then hit the Scan , it will start scanning your device for Virus. 12. Torch : There ia inbuilt Torch app in Redmi 1, you do not need to download any third party app. You can simply switch on your flash Torch from toggle menu. You can also use it from Tools box. 13. Compass :Next time when you go for some tracking or adventure trip, don’t forget to carry your Redmi 1S. As in Redmi 1s there is an Compass Sensor inbuilt, now you can use your device as a Compass. Simply Go to Tools>> Compass. 14. Notification Light : You can set your Notification light according to you, it is multicolor Led. Go to Settings >> Notification Lights . Now set your Notification light according to you. 1. Redmi 1S Charging Problem : Many people has faced this not charging problem in Redmi 1s, to solve redmi 1s not charging or battery problem. Just try to remove battery and reboot, if rooted unroot your redmi 1s. Otherwise try some other charger or try to factory reset redmi 1s. These are some tricks of Redmi 1S that you might not know. You must check and try all these , these are very helpful. You must share this with your friends who have Redmi 1s, so that they can also take benifit of these Redmi 1s features. 1) how to delete unwanted home pages from display. 2) how to move photos from one folder to another from gallery. 1.you cant move photos from gallery you have to do it from explorer itself. 2. you have to hold an aap and drag it to upside of screen it will show a message to remove from home screen or without any msg it will remove. 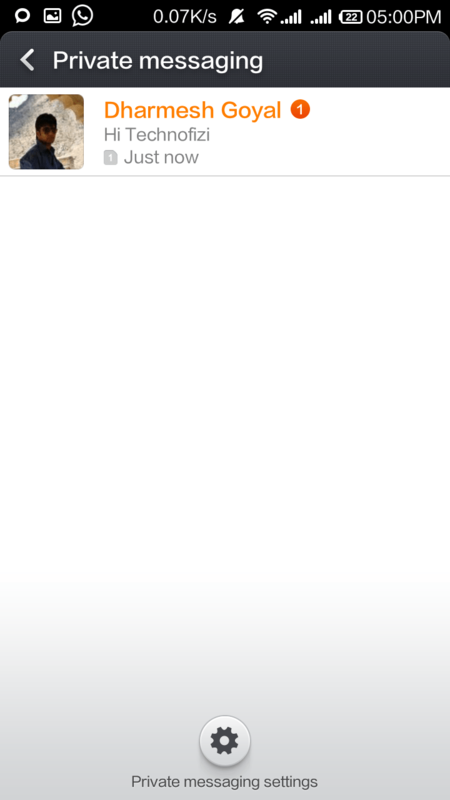 thanks for hidden app info.. its very helpful…. 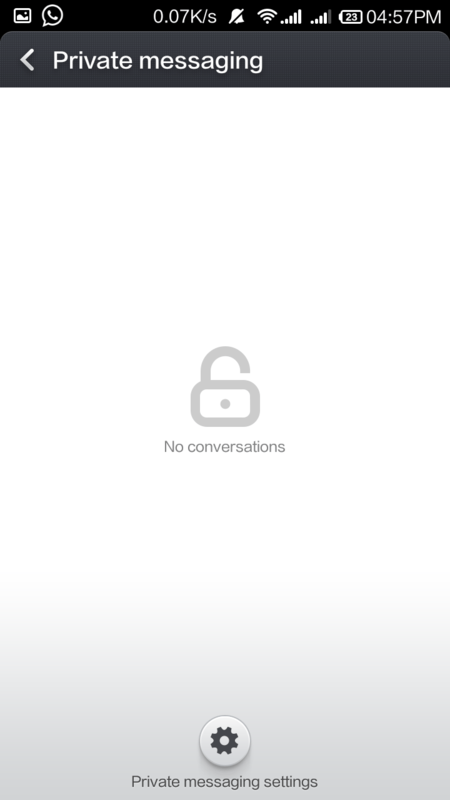 nice unknown thinks in redmi 1s….thanks for tell…. Mi phones have inbuilt app lock so you do not require to install any third party app, simply go to Notification Toggles >>Access and then you can manage app lock permission in MI phones. Shear it app not working on redmi 1s, do you have any solution ? Try XENDER app , agood app to share files and folder. try to reinstall share it app. thanks a lot for hidden app info.. its really very helpful…. Thank you very much. I have been looking everywhere how to put app in exception list of cleaner. This was the only article that helped. Hi I’m using a Redmi Note 4G. Everything works just fine except my WhatsApp where when people send me WhatsApp texts I can’t read through the WhatsApp messages content by scrolling down at the notification bar. It only shows how many texts I’ve gotten but not the content. Kindly advice. Thanks. Just try to update your Whatsapp first. If it is updated then look for any phone update. where can i find n change my sms centre number.. i cant find it in my mobile.. i cant send messages.. when i call customer care they said to change he sms centre number..but i cant find it.. I will play any online game just minimaize in few seconds then I will be open that game is restart which problem is occur in redmi 2 prime…..
Is it possible to enable mobile data automatically when wifi signal is not available in Redmi 1S? Just turn on both Mobile dat and wifi. When you are out of wifi range, it will automatically use your mobile data. my Phone redmi S1 charging time is very long 10 to 12 Hr. so plz help for fast charging. go to root folder of image and make a copy of image and move it to some other folder surely it will help you too. I have redmi 1 s. Its sceen is working but cannot see anythng.Screen is totally black.Sometimes it became visible and again it becomes totally black. Simple, just go to folder and drag the screen up to down, hidden folder will appear, select the file and make it unhide. How to change your mi account name, and how to change a password of it ….i am not able ti check my mi account? 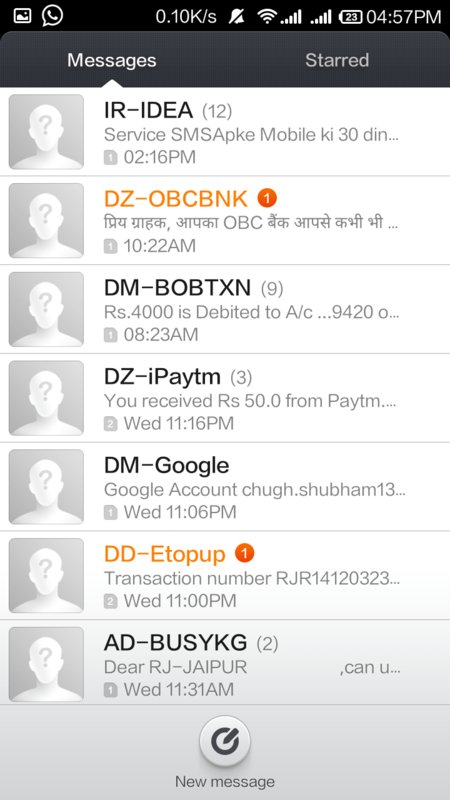 How to view sent messages in Redmi 3D prime? Even after deleting calls n msgs from log, they reappear the next day. How to avoid this.